Brenda's Needlepoint Studio: Journey, and a grand one at that. November, 2009. The NoVa Chapter brought in Sue Reed, a nationally known needlepoint designer and instructor, to teach "Journey", an advanced skills project, at a 2-day class. This was my first official class and even though I considered myself an intermediate stitcher (barely), I was greatly encouraged by chapter-mates to take the class because Sue is known for her patience and detailed explanations. Wow--what a great class. 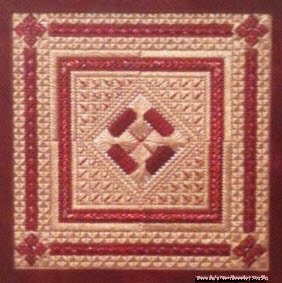 Sue gave tons of details regarding the stitches she used and how to execute them. She drew wonderful diagrams and let me take pictures of those drawings using my cell phone. They are now a part of my permanent stitching library. An example is shown below on how to change directions of the continental stitch so the thread remains slanted on the back of the work (for better coverage and tension).